Wild sourced - Aloe Ferox extract has been called "a pharmacy in a plant". It has been part of the traditional healing practices of the KhoiSan peoples of Southern Africa for centuries. It is found only in the Cape Province of South Africa. Used in the treatment of burn wounds, it relieves pain and increases blood supply by inhibiting the synthesis of thromboxane A2, a potent vasoconstrictor. It delays the inflammatory response and speeds up recovery time. Aloe ferox is bactericidal to a variety of common wound infecting bacteria. It has been shown to be fungicidal to Candida albicans responsible for yeast infections of the mucous membranes and for infections such as athlete's foot and candidiasis (thrush). Aloe ferox penetrates through the surface of the skin, thus hydrating it whilst forming a cover preventing the escape of moisture. It also increases oxygen supply as a result of increased blood flow and stimulates fibroblast activity and collagen proliferation essential for skin tissue regeneration. Aloe ferox reduces photo-aging by restoring the activity of epidermal cells reduced by UV exposure. 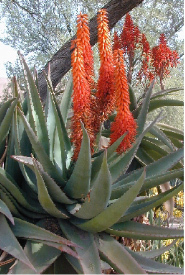 Aloe ferox grows wild and no pesticides, herbicides or fertilizers are used. The leaves are harvested sustainably and the plant is not destroyed, so that the cycle of growth begins again from the original plant. We use a powdered extract form of Aloe Ferox that has not been decolorized. This is important to note as EWG have rated it reasonably toxic or even carcinogenic if it is decolorized.